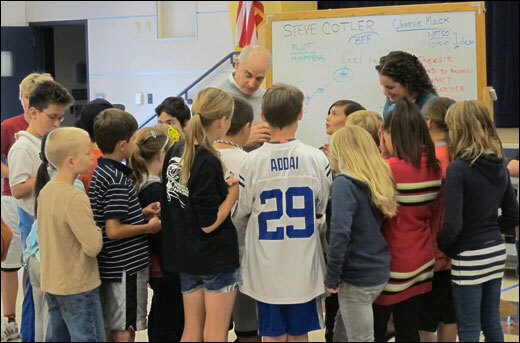 In this very short version of a typical school, library, or bookstore presentation, Steve Cotler exhorts the reading detectives to look for clues in the story. But I never thought about writing until I was a parent. I started with short, funny, rhyming stories for my children. With help from my Grammy Award-winning brother Doug, some of these stories turned into songs and finally I, singing as Pobba, recorded a CD of children's music: My 'Magination. I have done scores of concerts from Hawaii to the U.S. Virgin Islands and from Maine to Florida. Most of these were at schools...with kids laughing, cheering, and getting excited about the musical creative process. I love doing these shows. As most writers do, I work in solitude, imagining how the reader will react to my words. 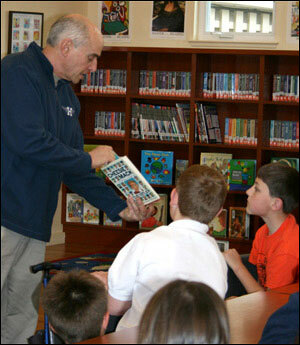 But when I visit schools, I am rewarded by the children's enthusiasm for books and a well-told story. 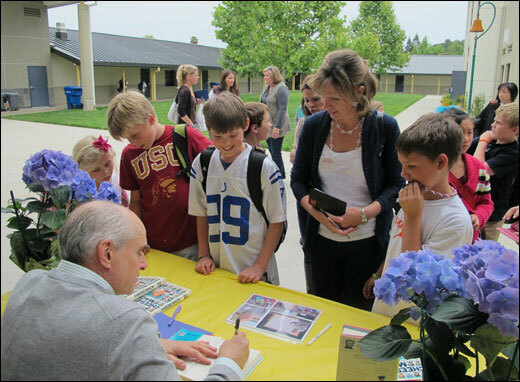 It is a great joy for me to energize them and to help them see themselves as readers and writers. 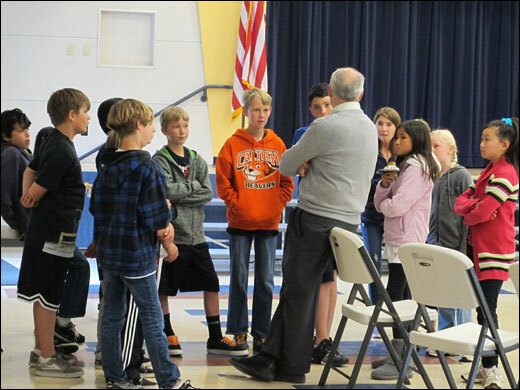 Asking the questions…engaging the students. at a school book fair. I am an author and a performer. When I talk with students and teachers about writing, I am animated, enthusiastically encouraging students to enter the discussion. Like all authors, I tell personal stories about the creative process, do readings, and talk about character, voice, plot, and setting. And if audience size and time permit, I ask for audience participation (think improv comedy) in a fast-paced creative process that builds these story elements from the students' own inputs. And of course, I encourage students to ask questions. 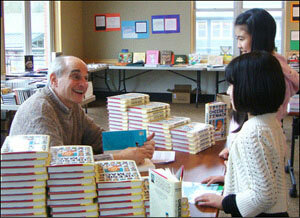 I am happy to sign and personalize books. In addition to formal presentations, I'll also talk informally with small groups over lunch; drop into classes for readings or kid-oriented seminars about writing. I'm open to your ideas. Just ask. Ages: Grades 3-5 are my sweet spot. Cheesie is 11, so most of my readers are 8- to 11-year-olds. Time: 55 minutes or so. Schedule and Cost: Contact me for calendar and pricing. 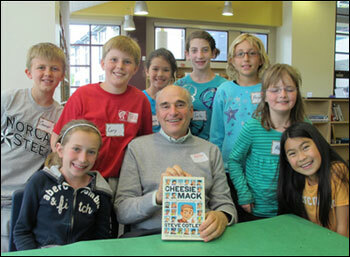 Grades 3-5: Who Is Cheesie Mack and Where Do His Adventures Come From? 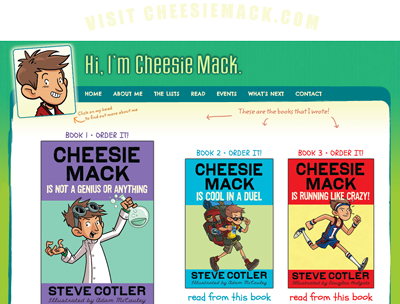 After a short reading to introduce the Cheesie Mack series, I talk about who the characters are and how I came up with them. I explain setting, mood, and plot. I help the students understand the challenges and joys of building an imaginary (yet believable) world for my characters. I talk about the importance of motivation and how to make the imaginary seem real to the reader. I discuss where ideas come from. For smaller groups, I improvise on the fly, asking for suggestions from the students... an adjective, a setting, a noun, an action. Then, constantly engaging and pulling ideas from the audience, I get the students to generate the skeleton of a story. The kids see this exciting process as a creative tight-rope walk. It is exhilarating, and I never know where it will take them... and me! 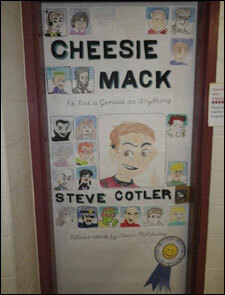 A very creative reading/art combo project: students reproduced the Cheesie Mack cover on a classroom door.